Boulder City Mayor Rod Woodbury hopes to eliminate an assistant city attorney position should contract negotiations with the current city attorney go through. Celia Shortt Goodyear/Boulder City Review Acting City Attorney Steve Morris listens to a presentation at Tuesday's City Council meeting. 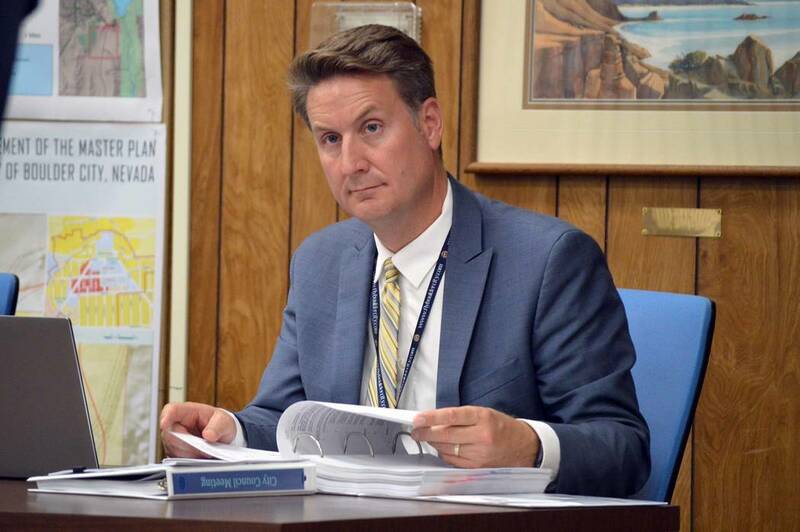 In a 3-2 vote at its meeting on Sept. 26, the City Council gave acting City Attorney Steve Morris a conditional job offer, pending an employee agreement, physical and background check. During KLAS-TV, Channel 8’s Mondays with the Mayors segment on Nov. 6, Woodbury was asked why Morris was the “right choice” for the job. After the interview, Woodbury said that he was anticipating eliminating the position, but he was unsure if it would happen. Bob Murray &Associates is handling the contract negotiations with Morris, and should they go through, Woodbury said that all the duties Morris has been performing as the assistant city attorney on the civil side will then come under his full-time job description for the immediate future. This possible elimination would not affect the other assistant city attorney position, held by attorney Gary Booker, according to Woodbury. “Regardless, the city will continue to need an assistant city attorney on the criminal side, and I have no reason to doubt that Gary Booker will continue his able service in that capacity,” he said. The city hired Bob Murray &Associates to handle the recruitment for the position, which drew 35 applicants. The list was then narrowed to 15.